LEDHead LED Lighting launched four new products at ProLight+Sound. The Mini-Map miniature LED screen measures just 150mm square and has 36 tricolour pixels controlled by DMX512. It is designed to be used individually or in clusters to provide video or visual effects. With a robust metal housing it is aimed at the touring and corporate markets. Manufacturing will take place in Britain. Frankfurt also saw the launch of the 3D-PixelTube is a spectacular lighting effect designed to be hung above a stage or dance floor. LED strips are built into tubes up to 2m long with pixelmapping control via DMX512. 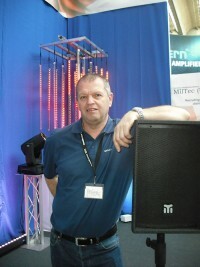 Two new LED moving heads, the EPW2 and EPW3 were also on show. Both units combine spot and wash functions with the additional function provided by individual control of the wash LEDs. The spot functions are provided by 180W and 200W LEDs and the EPW3 has a zoom lens. All LEDHead products are distributed by MilTec (UK) Ltd.
MilTec (UK) Ltd has designed a new range of professional speakers which will be built in the UK. Comprising three mid/tops, four subs, a stage wedge and a dual function single source/line array speaker, the Blakite and Blakite TR range will be suitable for use across the entertainment industry in theatre, concert, corporate and club venues. The mid/tops can also double as wedges or can be mounted on top hats, Powerdrive arms or the built-in flying points. The new speakers are all built in Britain from European birch ply and British and European components. They provide improved sound quality over the successful MT Audio range as well as increased power handling, efficiency and durability.